If you’re planning to go 3D this year, we have bad news for you: you’re going to have a headache selecting the right one for you because LG has an entire line-up of CINEMA 3D Smart TVs for you to choose from be it OLED TVs and even UD TVs. There are going to be a wide range of sizes too, according to LG, the company will be introducing a wider range of large-screen CINEMA 3D Smart TVs spanning between 55” and 84”. “Along with the rapid increase in Smart TV-equipped 3D TVs, competition is also expected to be intense over the next generation displays, including OLED TVs and UD TVs. 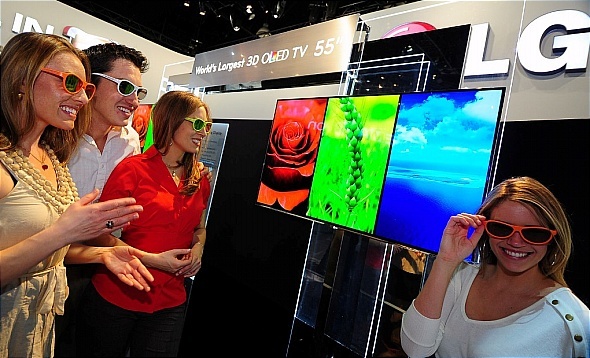 LG is planning ot strengthen the “3D = LG” image by ranking No.1 in the global 3D TV market. LG will also lead the Smart TV industry by continuously enhancing its own Smart TV platform, NetCast. Meanwhile, in order to establish a strong foundation to position LG as the global No.1 TV manufacturer, LG will continue to upgrade multiple types of TVs including LCD TVs, as well as next generation display products such as OLED TVs and UD TVs.” – Mr. Havis Kwon, President and CEO of LG Home Entertainment Company. Hit the break for the full press release and find out how the company plans to strengthen its position in the industry. Jan. 13, 2012 -– LG Electronics (LG) held a press conference in Las Vegas, where Havis Kwon, President and CEO at LG Home Entertainment Company, announced the company’s medium- and long-term strategies for its TV business. In order to rank No. 1 in the global 3D TV market, LG will expand its large-screen CINEMA 3D Smart TV lineup, release more lightweight 3D glasses and enhance the availability of 3D content. In total, approximately 70 percent of new LG TVs will be 3D-capable. The quantity of 3D TV models, whether entry-level or premium will be expanded, and the Smart TV function will be included in each TV set as a basic feature. Furthermore, LG will pursue synergistic efforts with LG affiliates, namely LG Display, LG Chemical and LG Innotek, to continue vigorous technological developments in 3D. In order to strengthen its Smart TV business, LG will place central emphasis on increasing the competitiveness of its proprietary platform, expanding content and services and innovating the user experience. Scheduled to be released this year, the new version of NetCast will allow easy use of LG’s Smart TV ecosystem which continues to grow in both scale and sophistication. In order to improve its ease of use, the Integrated Search function has been added to enable a quick and easy one-step search process for known content and apps. Meanwhile, the new Magic Remote maximizes user convenience with the four control modes of Voice Recognition, Wheel, Magic Gesture and Pointing. LG will continue to form strategic partnerships with 3D content providers, in order to establish the CINEMA 3D Smart TVs as the Smart TVs with the largest 3D content selection. LG’s LCD TV product line-up will be noticeably fortified. Through wider application of LG’s CINEMA SCREEN Design, a greater share of LG’s LCD TVs will be equipped with ultra-slim bezels to allow for optimized 3D viewing experiences that are more immersive and comparable to a movie-going experience. Such immersive displays will grow in size, as a greater number of LCD TVs will measure at 60 inches or greater. Meanwhile, LG will also become the industry’s first to launch an 84-inch UD TV whose resolution is four times greater than existing Full HD TVs. In 2012, LG plans to capture and solidify an early lead in the next generation display market by becoming the industry’s first to launch an OLED TV. Following the 55-inch OLED TV’s inaugural launch in Korea, the next generation TV will be launched in other markets across the world. Already dubbed “the future of TV,” LG’s OLED TV exhibits unparalleled picture quality and design. Meanwhile, LG’s OLED panel requires low manufacturing costs, as it is a WRGB-type display panel which is most suitable for large-screen TVs. Additionally, LG’s display panels can be manufactured with high productivity, due to their low defect rates. LG decided to feature a 55-inch display panel for its first OLED TV, due to increasing demand for large-screen TVs and LG’s goal of leading the next generation display market. OLED TVs in the 40-inch range are also scheduled to be launched later on. Their launch dates will be determined in accordance with market developments. One of LG’s core objectives is to bring about greater innovation in its supply chain management. LG will accelerate its integrated management of demand forecasts, supply plans, purchasing and manufacturing. LG will also work towards reducing the lead time when working with business partners. Furthermore, the existing completion type overseas manufacturing facilities will be strengthened, reducing tariffs, increasing logistical efficiency and internalizing core processes. In so doing, LG expects to enhance the competitiveness of its global manufacturing capability.